I got the last two Wood Jewels I needed from Hera-Ur, uevoed my remaining Beelzebubs and fed them for the guaranteed skill ups. This project took about 16 days, obviously significantly accelerated by generous stone usage. I used about 12 stones to get the necessary jewels that I didn’t already have. The EXP came mostly from Snow Globes saved up over time and fodder from alt. coin dungeons. I can’t really say it would be worth it to travel this route on just natural stamina, especially from scratch, but it beats farming Badpys for sure. The next question is whether I +297 him. I almost certainly will, especially with 5x technicals coming on Monday. Then the follow up question is: will I +egg his team? I’m not sure about that, but I’m leaning towards: yes, kinda. I’ll almost certainly hypermax my Haku, but I’m still on the fence on +egging potential subs like Persephone, RSonia and D/W Batman. I’m still undecided if I want to focus on prongs or rows; rows definitely seems more mainstream, reliable and powerful, but I love me some TPAs. While I have plenty of +eggs saved up — and I’m expecting at least 150 more come Monday — I’m also considering feeding away my hypermaxed Athena and Meimei. Well, I’d preferably keep my Athena, but I think I’m in the clear to feed away Meimei. I have a second one max skilled should I need her again and I’m thinking of putting Apocalypse on my Athena team now that he has skill up fodder and his cooldown is being reduced to 10 turns. I got the last Dub-sapphlits I needed to evo my last three Beelzebubs and I also got the Wood Jewel on my second try from the gift dungeon, resulting in having three uevo and two evo Beelzebubs. I’ve updated the tracker to reflect this. All I need are two Wood Jewels and some unsightly amount of EXP to finish off my this project. Luckily, the Snow Globe feed EXP change has just gone live. I have six, so that should take care of at least 12 million EXP. The 4th awakening is stored even though the evo form only has 3 awakenings. …and the 4th awakening appears. This Beelzebub is ready to skill up via guaranteed uevo skill ups. I farmed the remaining Keepers I needed to evo 5 more Beelzebubs, which was enough to do the first round of pre-awakenings (also known as over-awakening, among other terms). 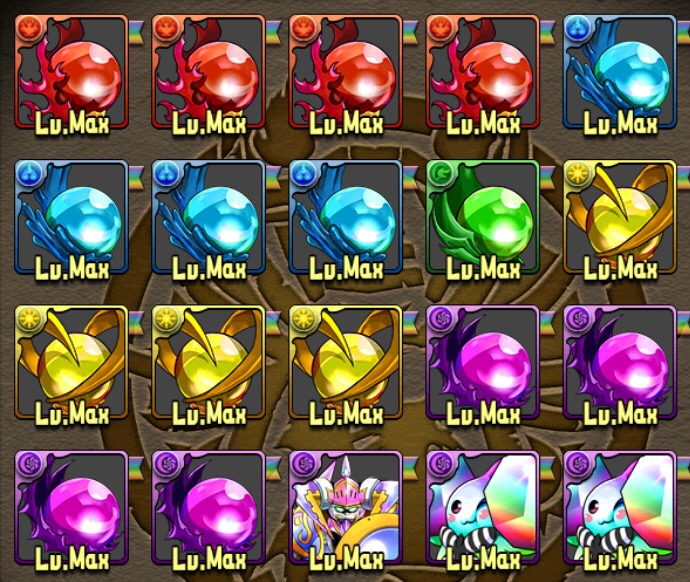 Now I only need 3 Wood Jewels and 3 Dub-sapphlits to finish off the evo mats, but still need about 25 million EXP. I’ve updated the tracker page with my current progress. Unfortunately I’ll have to wait for the next event to farm wood jewels. Hopefully this Mythical-only at 1.5x appearance rate is a permanent thing as it really seemed to help with the invade rate (29%). Farming Thoth & Sopdet was particularly profitable as that dungeon also drops keepers. I’m hoping I’ll be able to farm the rest of the keepers I need tomorrow, evo everything, stone Super Metals (although I’m leaning towards not stoning for EXP) and have everything ready for the next Meimei invade. Things are going much quicker than expected, but I guess that should be expected when throwing stones every which way. The first, easiest step has been completed. The project page has been updated to reflect this. Now I need to farm evo mats, namely keepers on Monday/Tuesday. I really should’ve gotten the rest of the Dub-sapphlits I needed last Friday while the event was still active. Well, there’s no rush, I guess, but I’d love to free up the box space, particularly with the Yamato Takeru skill up dungeon coming tomorrow. I don’t know how long it will take, but my latest goal is to raise a uevo Beelzebub to max level, awakenings and skill level without using Tamadras or Badpys. Beelzebub is a worthwhile investment as he’s one of the best leaders in the game. He also happens to be farmable so it will be realistic to use guaranteed uevo skill ups on him. That is, if you consider feeding 5 sets of jewels realistic. I plan on using him for clearing high level content, but I’m not sure if I’ll invest any +eggs into his team yet. It may be realistic to feed the +eggs on my Athena team to him if it turns out he’s as good as I hear. This project won’t have an extremely high priority, but I figured it might be something fun to do with all these extra jewels I get instead of feeding them to the China girls and failing. The worst part of this project will be leveling everything up. I get plenty of EXP fodder from doing alt. coin dungeons, but the uevo Beelzebubs coming in at 5mil a pop is might call for some stoning of Super or maybe even Extreme Metals. Luckily the present egg feed EXP boost was hinted at in today’s stream (I think I have about 5 sitting around in my box) which will help a lot. Progress will be kept on this page, but I’ll be doing individual posts when milestones are met. Any small updates will be rolled into my Weekly Roundup posts.